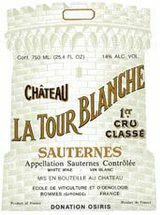 This wine is the result of a severe selection using the three traditional grape varieties Sémillon, Sauvignon and Muscadelle. Pale yellow and still relatively opaque. Citrus fruits reminiscent of lemon rind. After swirling hints of candied fruits like dried figs, dried apricots, grapefruit and torrefaction come through. The slight aromas of vanilla underline the fact that 100% new wood is used for maturation. A supple attack, rich and full-bodied. A promising vintage. The candied fruits detected on the nose are equally present on the mouth with a good balance of sugar, alcohol and acidity. Its aromatic persistence is remarkable due to its spicy finish. Particularly long on the palate. 91-93 Barrel sample. A deeply golden-colored wine, but to taste, it is more poised and fresh than the color suggests. There's an attractive liquorous feel to the wine, but that is balanced by good clean, fresh fruit tastes. This will be delicious. Subtle aromas of honey, lemon peel, cream, vanilla and apple pie follow through to a thick palate, with lots of sweetness. There's also loads of clove and other spices. Not as exciting as from barrel, but still outstanding. Best after 2011.